We may not be blessed with tropical rain but should you want to recreate a Hawaiian paradise in the garden, it’s still possible even in drought-stricken Southern California. Color and texture both play a big role in designing a tropical garden. Look for blooms that are yellow, orange, red and pink as well as plants with large green leaves. Speaking of Hawaii, the fragrant flowers seen on most leis are from Plumeria trees (pictured above). The gorgeous blooms with seemingly perfect petals come in a wide range of colors from yellow and white to bright pink. 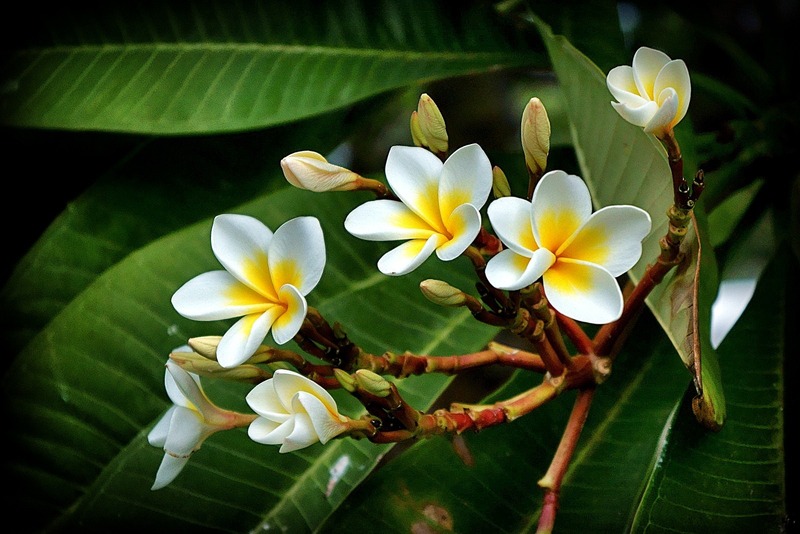 Plumerias are semi-deciduous trees that do not require much water once established and can handle poor soil. However, it’s preferable to put them in a location with good drainage as well as in full sun otherwise they won’t bloom. It is also possible to grow plumerias as container plants. The height and width of a plumeria tree depends on the type chosen but they can easily grow to 20′ in San Diego landscapes. Flexible bromeliads can add a tropical look as a house plant or one that’s used outside in climates without freezing temperatures. Depending on the species, they can grow in light soil or attached to trees. Bromeliads sprout pups which means a plant can slowly spread to cover an entire surface if left unpruned. Or, go ahead and repot the pups as house plants or repurpose them to another location outside. Keep bromeliads out of full sun even in coastal regions and make sure they have enough air circulation to keep them happy. A growing trend includes mixing bromeliads into succulent and rock gardens where a bit of flourish is needed because they don’t need much water. Of course, palm trees symbolize sunshine and vacation. They’re everywhere in Southern California so you’re probably well-aware that they thrive in our climate. 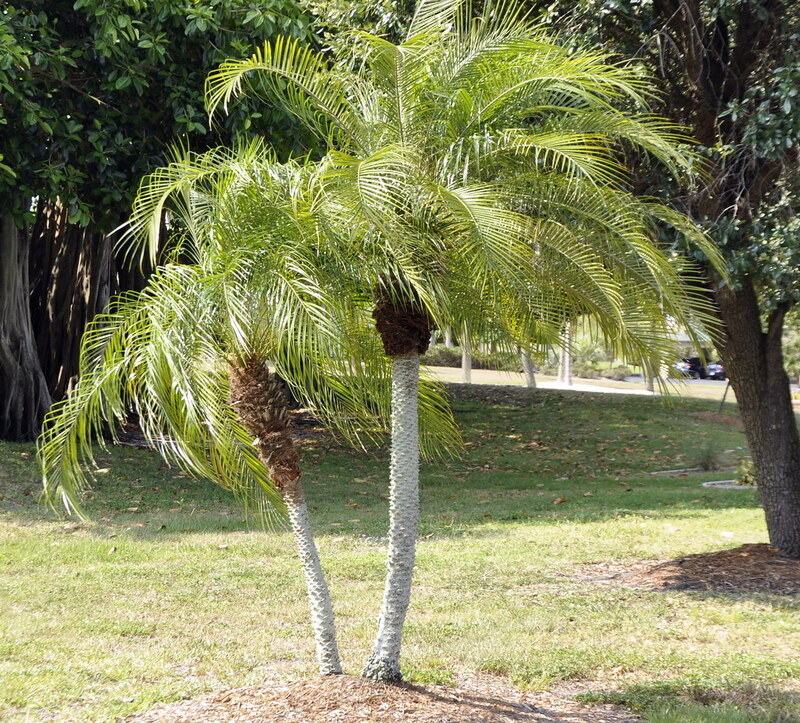 Pygmy date palms (pictured above) are low maintenance, grow in a compact form and are good for housing developments with height restrictions as they do not reach more than 10′. However, be mindful that they do have thorns at the base of their leaves. But really any palm tree that you have the space for will add a tropical look to an outdoor living area and most don’t need much water after becoming established, which is surprising for how tall they can get. Birds of paradise basically have one major dislike… too much water. A sure way to kill the plant is to leave it in soggy conditions. Otherwise, it’s very easy to grow and seen in gardens all over Southern California. Like many others on this list (as well as other water-wise gems like succulents and California native plants) regular water is required until the roots are established. The showy orange flowers, thought to resemble the flying birds of paradise, bloom in the spring. The version pictured above reaches a height of about 3-5′. A giant bird of paradise that grows up to 20′ tall is another option for water wise gardeners in search of a tropical look. These plants have long leaves arranged like a fan on top of a tall stem and are narrow enough to be placed along fence lines where extra height is required. Their flower looks the same as the more compact version except its colors are white and black. Bougainvillea is a tropical vine that explodes with usually three rounds of showy pink, white, blue, orange or red blooms in spring, summer and autumn. The big clusters of papery flowers can at times literally cover the entire plant. 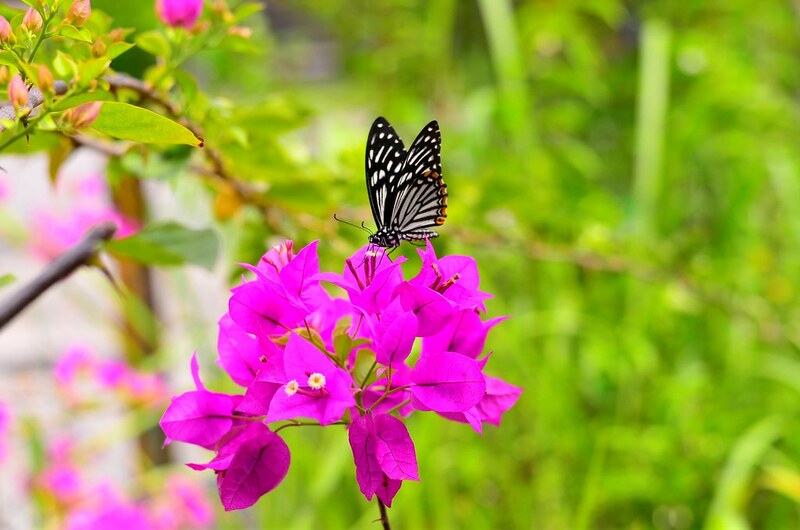 The vines can climb up to 40′ depending on the variety and some bougainvillea can even grow well in containers. Either way, place it in full sun and well-drained soil. Be mindful that many varieties do have thorns on them. If it is important to support local bees, butterflies and other pollinators, this low water plant is an excellent choice. Also called a Torch Lily, a Red Hot Poker plant grows up to about 5′ tall and does an excellent job of attracting hummingbirds and butterflies with sweet nectar. The green sword-shaped leaves give way to red and orange tubular flowers that resemble a torch in the late spring through fall. Deadhead the flowers in order to encourage more blooms. A yellow poker plant is also available in local nurseries. Both types prefer full sun. 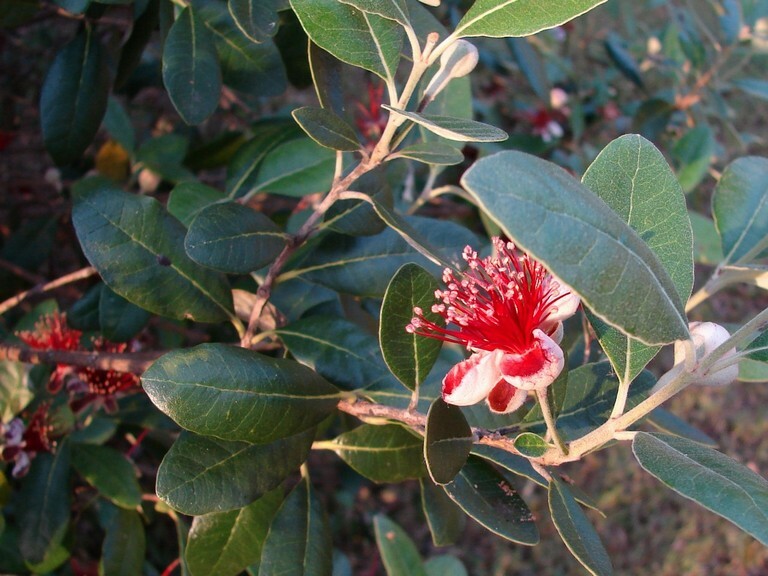 Pineapple guava trees yield beautiful edible flowers that are white with red accents. Blooms appear in summer and contrast nicely against the grey-green foliage. The resulting fruit is also tasty and typically follows in the fall. This tree is easily trained into an espalier (where trees are pruned to grow against walls), a hedge or into a compact form. If left to its own devices this evergreen tree will grow to about 10-15′ tall and wide. Plant in full sunlight and only water occasionally after it’s established. Zephyr lilies make excellent border plants because they only grow about 1′ tall and can fill in a space quickly on their own. The blades have a glossy green tropical look and delicate white flowers that emerge in the spring. 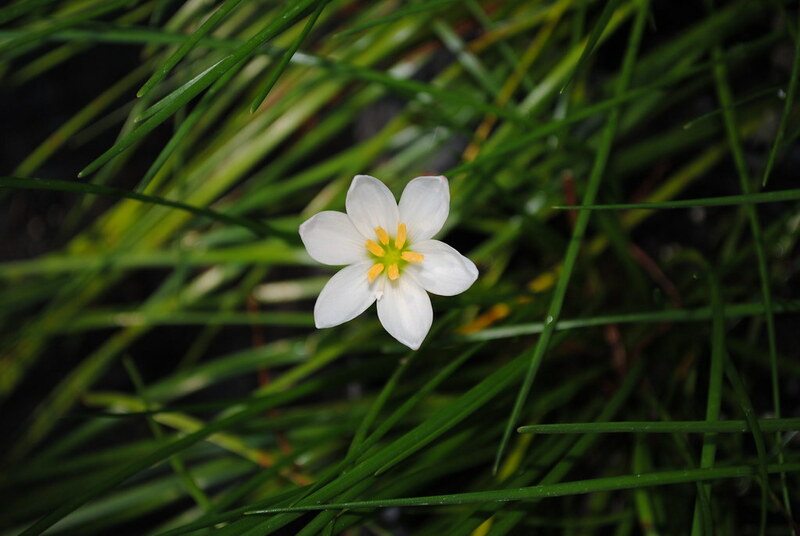 They are pretty easy to grow by bulb but will take a few years to bloom using this method. They can handle full sun or partial shade and tend to regrow after being trampled by kids and pets. The flowers of a blue hibiscus plants aren’t actually blue but that’s O.K. the stunning shades of purple, pink and even white look plenty tropical. Depending on the type, they can grow up to 10′ tall and wide. It’s a very drought-tolerant shrub, prefers full sun and can handle nutrient poor clay soil. It will usually survive serious pruning after the blooms have subsided if you want to cut it back. Which low-water plants do you use in a tropical garden?